A powerful graphics card is likely the most expensive component in your PC if you're a gamer, but with all current and past-gen GPUs available in the range of $100 to $500, it can be tough to pick the right solution for your needs. In an effort to narrow things down, we're about to compare today's most relevant gaming cards that sell for $200 or more, testing them in a slew of games to see how it breaks down as we look for the best graphics cards for gaming at resolutions of 1920x1200 and 2560x1600. Most GPU releases go through our testbench, however when we review these graphics cards, the GPUs are fairly new or barely making it to market, drivers are not entirely optimized, and most importantly, true market pricing has not settled down to its long-term value. Relative performance leads more often than not remain the same through the life of the GPUs, but our take on best value is completely changed the second Nvidia or AMD decide to adjust their prices. To give you a clear example, the Radeon HD 7970 debuted to market last January with a sticker price of $550. A couple of months later the GeForce GTX 680 arrived offering better performance for less money. 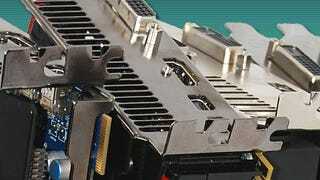 AMD quickly reacted slashing the HD 7970's price to $450. Similarly, the slightly slower HD 7950 was dropped from its original price of $450 to just $350. The table above includes all the cards we'll be benchmarking, starting with the most recently released. Note that although we have the Radeon HD 7970 GHz Edition on hand, we didn't include it in this review because we don't see why anyone would buy the factory overclocked solution at a $50 premium. We picked ten games for our test, six of which are DX11 titles and include recent releases such as Max Payne 3 and Alan Wake. Games will be run at 1920x1200 and 2560x1600 as we believe these are the resolutions gamers are targeting with today's $200+ graphics cards, using monitors between 24 and 30 inches. All games will be tested with fraps which lets us record 60 seconds of gameplay. Call of Duty: Modern Warfare 3 — as you likely know — isn't particularly demanding, making the GTX 670 and HD 7000 series overkill. At 1920x1200, the HD 6870 is more than capable of delivering a smooth experience at 71fps, as is the GTX 560 Ti at 73fps. Despite looking great, Deus Ex: Human Revolution isn't all that demanding on current-gen cards — in fact, even the older HD 6870 and GX 560 Ti perform well. The best value at 1920x1200 is the HD 7850, while the best performance-oriented card is the HD 7950 at 87fps. Max Payne 3 plays exceptionally well on the new GTX 600 series cards and we believe that the GTX 670 is the best choice if you're looking for high performance, while the HD 7950 is the best value at 61fps, or only 6fps behind the pricier HD 7970. Although it doesn't look (or perform) like it, The Witcher 2 uses DX9, which we found hard to believe when first testing this game. The game is pretty demanding at 1920x1200, though the GTX 670 managed to deliver 72fps, securing our performance-oriented pick, while the HD 7950 was only 5fps slower at 67fps, making it our value pick. While it is also a DX9 title, Skyrim isn't as demanding as The Witcher 2, so the GTX 670 can be considered somewhat overkill at 86fps, but it's still our top pick for a performance solution, while the HD 7870 is our value choice as it was on par with the more expensive HD 7950 at 63fps. The GTX 670 is a clear winner when testing Alan Wake at 1920x1200, averaging 61fps, slightly faster than the HD 7970 and just a fraction slower than the GTX 680. The best value option here is the HD 7950, which was just 10% slower than the GTX 670 while costing around 15% less.